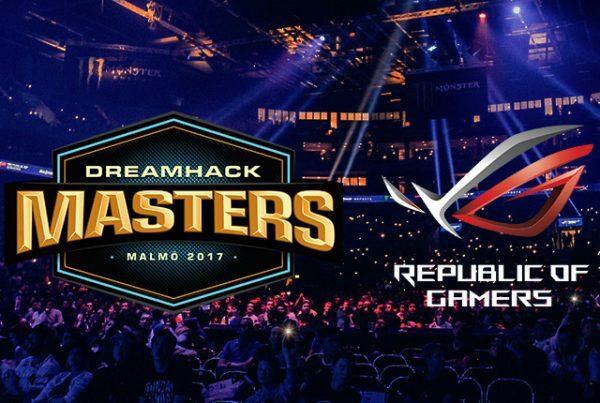 ASUS Republic of Gamers (ROG) today announced its continued partnership with DreamHack as the main sponsor of monitors and computers for the DreamHack Masters Malmö 2017 global CS:GO tournament to be held in Malmö, Sweden from August 30 to September 3, 2017. Professional gamers at the event will compete using a variety of ROG gaming gear, including the ROG G20 desktop and the ROG Swift PG248Q monitor. Gamers who take part in the Join the Republic audition to join Adam “Friberg” Friberg’s team for the Bootcamp and Grand Final stages will use the brand-new ROG Strix Fusion 300 headset while they show off their skills. The production and talent will rely on the ROG Strix SCAR gaming laptop that is optimized for FPS gameplay to observe and analyze the gameplay. The ROG-sponsored CS:GO professional team, Ninjas in Pyjamas will also compete in the event. “With the continued support of ROG and its top line products, we’re able to offer the best possible equipment and an environment for the players to thrive in. ROG has been the perfect partner in our endeavor to create outstanding CS:GO events around the globe, and we are thrilled to continue this partnership going into DreamHack Masters Malmö.” said Tomas Lyckedal, Chief Brand Officer at DreamHack. ROG G20 is a 9.5-liter gaming PC designed to dominate the small-form-factor gaming desktop segment. It’s powered by the latest 7th Generation Intel® Core™ i7 processor and the latest NVIDIA® GeForce® GTX 1080 graphics — giving it the punch required to run the latest AAA gaming titles at their highest graphics settings. G20 features ASUS Aura lighting effects, an ESS SABRE HiFi audio headphone DAC and amplifier, and ROG-exclusive gaming software including Aegis III. An advanced heat-management design ensures effective cooling for stable performance during marathon gaming sessions. On top of that, it runs silently at just 22dB at idle. ROG Swift PG248Q is a competition-grade gaming monitor that provides seamless visuals and super-smooth gameplay. It features a 24-inch Full HD (1920 x 1080) panel with a 16:9 aspect ratio and is NVIDIA G-SYNC™-ready. Swift PG248Q boasts an overclockable 180Hz refresh rate and 1ms gray-to-gray (GTG) response time to eliminate screen tearing and choppy frame rates. ROG Strix Fusion 300 is the first gaming headset in the brand-new ROG Strix Fusion series. Featuring an exclusive, airtight chamber design, 50mm ASUS Essence drivers, built-in virtual 7.1-channel surround sound and ROG Hybrid ear cushions, Strix Fusion 300 lets users enjoy fully immersive gaming experiences with uncompromising comfort and sound quality. Strix Fusion 300 is compact and lightweight to provide maximum comfort during marathon gaming sessions, and features a futuristic, metallic design accented by stylish lighting effects. Compatible with a wide range of devices — including PC, Mac, game consoles and smartphones — Strix Fusion 300 delivers immersive gaming and media enjoyment at home or on the go. ROG Strix SCAR Edition is built exclusively for the sharpest shooters in the meanest gunfights — optimized to gain a competitive edge in FPS games such as Counter-Strike®, Overwatch® or Tom Clancy’s Rainbow Six® Siege. Powered by the latest Intel Core i7 processors and NVIDIA GeForce GTX 10 Series graphics with an ultra-fast 120Hz and 5ms display, styled with unique focus, and with desktop-style keyboard layouts engineered for victory, Strix SCAR Edition keeps the gamer centered on the battlefield — so they’ll rank high, and kill with absolute precision.